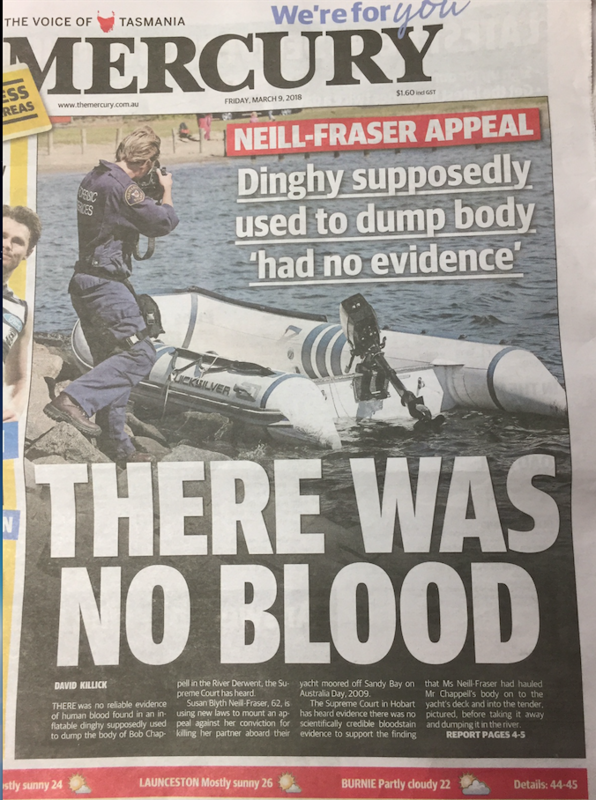 After the full day of hearings in the Supreme Court on Thursday, March 8, the Hobart Mercury splashed the report by David Killick on their March 9 front page under the headline THERE WAS NO BLOOD, with a slug above it that read: Dinghy supposedly used to dump body ‘had no evidence’ The dinghy refers to Neill-Fraser and Bob Chappell’s yacht, the Four Winds. But this is not new evidence, as DPP Daryl Coates SC pointed out to the court: it could have been stated at the trial. It doesn’t surprise those who never believed that there was an incriminating amount of Bob Chappell’s blood in the dinghy, which the prosecution claimed was used to dispose of Chappell’s body after Sue Neill-Fraser had killed him below decks with a wrench, according to the Crown. However, a dramatic front page headline declaring the evidence given in court the day prior, in such a bold fashion, could well change perceptions: many of those who had no doubts about the safety of the conviction, might now entertain a shadow of doubt. If they then see Melbourne’s Sunday Herald Sun the following day (March 10, 2018) with Andrew Rule’s 1,680 word article “Twists in the tale of Bob Chappell murder mystery” they can’t fail to note the headline’s ambivalence – it’s a ‘mystery’ – and the new tone of doubt expressed in the article. LET’S get one thing straight. Someone killed Bob Chappell, the Hobart radiation physicist who vanished from the yacht Four Winds moored at Sandy Bay late on Australia Day, 2009. It’s remotely possible Chappell tried to scuttle the yacht, made himself bleed then jumped or fell overboard and was swept away — or eaten by a shark — so his body was never found. But it’s not the way to bet. The brilliant barrister Robert Richter put the proposition — in gaining a murder acquittal for gangster Mick Gatto — that when weighing possible explanations for any event, follow the Ockham’s razor rule: the simplest and most obvious explanation is best because it requires fewer risky assumptions. In the Gatto case, Richter used the fact that the revolver that killed hitman “Benji” Veniamin had misfired one of six bullets. He said the misfire happened because Veniamin and Gatto were wrestling over the pistol. Right or wrong, the jury bought his theory because it fitted the facts and was believable. It perfectly matched Gatto’s story that he grabbed the revolver from Veniamin. Applying Richter’s sharp logic to Chappell’s disappearance, it seems overwhelmingly likely he was murdered and his body disposed of. Anything else doesn’t pass Ockham’s razor. But whodunit? Was it for revenge or financial gain by someone close? Or robbery gone wrong by strangers? This is the $750,000 question, the amount a dedicated Melbourne film maker has spent on a documentary on the proposition that the woman convicted of Chappell’s murder — his longtime partner, Sue Neill-Fraser — is innocent. Of course, the fact that Australian police forces have locked up innocent people too often does not automatically mean Tasmanian police are wrong about the woman now serving 23 years. Neither is she automatically innocent because the prosecution case is under attack from a coalition ranging from family and friends (though not Chappell’s family) to a crusading Adelaide legal academic Dr Bob Moles, Robert Richter among other concerned lawyers, and two former Victorian detectives. But it shakes faith in the original prosecution. The case that bitterly polarises opinion in Tasmania will see entrenched beliefs and biases tested by new material uncovered by a former detective now reviewing it. Colin McLaren is a former undercover agent and veteran task force investigator. His investigation strengthens Neill-Fraser supporters’ belief that she has suffered an unsafe conviction — not just because the case against her is purely circumstantial but, more importantly, because McLaren now clearly earmarks alternative suspects. The onus is always on the prosecution to prove guilt beyond reasonable doubt. In this case, the doubters have new evidence, which casts a shadow over the prosecution that created a first in Tasmania — a murder conviction with no body or “smoking gun” evidence. In another twist, McLaren is now effectively a fugitive because he has been warned of a Tasmanian police plan to charge him with perverting the course of justice. Not because he has committed any offence, he says, but because even trumped-up charges would block publication of his book under the sub judice rule. Why would they do that? “It’s all about protecting reputations,” he says. McLaren has written five books since leaving the force. One was a novel based loosely on his life in the spooky world of undercover work. It is called On The Run. Now, in a case of life imitating art imitating life, he really is on the run. The 60-something grandfather left Australia six months ago when a barrister suggested he take a long holiday following the arrest of two other people — one a Tasmanian lawyer — on charges of perverting the course of justice. After confirming suspicions his telephone and emails had been tapped by Victoria Police for their Tasmanian counterparts, he flew to Sri Lanka last October and reached Europe on a series of short flights. He wants to come home to see his daughter and grandson but doesn’t dare risk arrest. Besides that, a recent history of heart attacks makes stress and long-haul flights a health risk. This week he is finishing a documentary about organised crime before resuming work on the final draft of his book. McLaren says he came to the Neill-Fraser case with an open mind after being approached by crusading filmmaker Eve Ash in early 2016. Ash had already made up her mind well before that — both from honest personal conviction and the professional opportunity to make an “Innocence Project” type of documentary. Films soak up much time and money, so it is vital to find subjects to interest an audience, prospective investors and buyers. “Small story in Tasmania: unknown woman jailed” is not box office, whereas “Free Susie” might be. Any successful film or book pitch on the Neill-Fraser case probably has to embrace the angle of justice gone wrong. But just because the “doubters” have a vested interest in proving Neill-Fraser didn’t kill Chappell, it doesn’t necessarily mean they are more one-eyed than the police and prosecution. EVE Ash has made Shadow of Doubt. McLaren has finished a first draft of the book, title undecided, which he has shown the Sunday Herald Sun. It raises thorny questions for Tasmanian authorities — questions that at least deserve answers. “There are few more powerful stories or more satisfying tasks than to expose a miscarriage of justice that lands the innocent in prison. It’s so powerful and seductive that crusading reporters and lawyers (among others) scramble to chase anything that looks suspect. That assessment still applies: “white knights” love finding damsels in distress so much that they go looking for them. Authors and reporters less scrupulous than McLaren might even cherry-pick and embellish facts to boost a saleable storyline. McLaren’s softly-softly investigation has uncovered material that undermines a police investigation he says cherry-picked some facts and buried others. That is also the view of Robert Richter, fellow Queen’s Counsel Remy van de Wiel and former homicide detective Charlie Bezzina, who checked McLaren’s investigation independently. Enlisting McLaren was a shrewd move by Ash. It was a case of poacher turned gamekeeper — few former detectives or reporters would know more about the shortcuts police use to “get a result”, and the blinkered approach they sometimes take once having picked a prime suspect. McLaren went to Tasmania several times with Ash’s film crew, scouted the crime scene and knocked on doors. He insists he did not use any underhand police methods to solicit convenient information or to exploit easily manipulated Hobart fringe dwellers. He traced several leads, he says, that the local police missed, ignored or suppressed because in their zeal to nail Neill-Fraser. He unravelled intrigue surrounding Meaghan Vass, who in 2009 was a homeless teenager roaming the streets with known thieves, and whose name came up after her DNA was found on the yacht. DNA is a powerful but sometimes risky tool for police, and has the potential to cause huge bungles if not supported by other evidence. But McLaren dismisses the idea that traces of Vass’s DNA could have reached the yacht accidentally by “secondary transfer” because the scientific evidence shows a strong DNA sample from a volume of body fluid. This fits because McLaren turned up evidence that Vass’s criminal boyfriend regularly broke into boats and had stolen from yachts moored in Sandy Bay near Four Winds around the time Chappell disappeared. McLaren also got hold of a police document and was able to show it had been doctored to blank out the name “Megan”. It indicated Vass and her boyfriend had been on a burglary spree in the area on the night of Chappell’s death. Most troubling of all, he says, was a long conversation with Vass, in which she described being on a yacht at night with unnamed males, that there had been “a fight” with an “old guy” and that she had fled the scene in a dinghy. McLaren also found that two men with violent criminal pasts were both close to where Four Winds was moored. One (now serving time for an unrelated attempted murder) actually went to police to say that the other man — who lived on a boat virtually next to Four Winds — had murdered Chappell. He also said he had seen “a young girl” on the night in question, who had boasted she and a male friend were going off to steal from boats. The girl matched Vass’s description. McLaren calls the boat dweller “Pablo”, and nominates him as a key person of interest because he sailed off immediately after Chappell’s disappearance and later gave vague and misleading evidence that went unchallenged. McLaren found Vass too frightened and erratic to tell him all that he thinks she knows. But she referred often to something bad happening on a yacht. And McLaren was struck that she was so apologetic about Neill-Fraser’s jail sentence, repeatedly saying she was “haunted” by it. She also told a psychologist that Neill-Fraser was innocent. McLaren will stay overseas until his book is published. It might eventually help Neill-Fraser overturn her conviction. That alone will not prove she is innocent. And if she fails and rots in jail, that doesn’t prove she’s guilty, either. It’s a genuine mystery. It is troubling there were at least three criminals who could have killed Chappell. It is troubling that Neill-Fraser was taped speaking of him in the past tense as if she knew he were dead when no one else was sure. But none of it is more troubling than the suggestion the state is trying to muzzle those who dare question the work of its police and prosecutors. It has the whiff of tin-pot tyranny and makes you wonder what they are trying to hide.